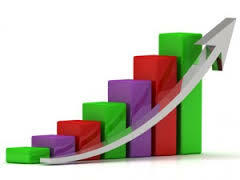 The focus and conclusion of the study was that patients are getting more comfortable with health information technology. How do these results relate to Home Care clients? What's not clear in the study is how many of those patients are of "home care age", in their upper 70s and above, and whether they are getting value from health information technology or not. 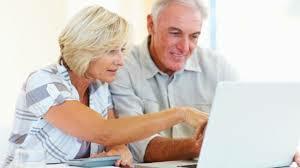 Tech savvy among the elderly varies greatly. If I look at my own parents, my mom is 78 and she's pretty tech savvy. She uses an iPhone and has several computers that she uses for browsing applications and facetime with my niece. By contrast, my dad passed away at age 71 and he had grown up in the corporate world with secretaries who did the typing and others who used the computers. He would be 83 as I write this and I don't think he would have learned or embraced technology. While two parents does not make a statistically significant sample, I believe that it is somewhat representative. In addition to being tech savvy, my mom is very independent and years away from needing home care. From what I experience through our home care customers, I perceive that typical home care clients are more like my dad. What Can Home Care do to improve the Engagement between our Clients and Physicians? Prior to an appointment, ask your client what things they would like to ask their doctor and write them down. If there are items not mentioned by the patient that are of concern to the aides who work with the client, write these down as well. If you can handle the services described above, then your agency is likely to be ready to expand into the world of care transitions. 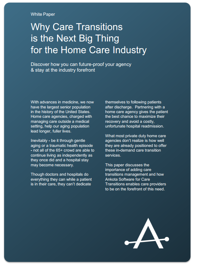 We have a free white paper, Why Care Transitions Is The Next Big Thing for the Home Care Industry that can offer you more insight on this topic. Just click the link or the picture below to download.